What can you glean watching Nintendo of America president Reggie Fils-Aime on last night's Late Night With Jimmy Fallon? You can you learn that, apparently, all-star developers Koji Kondo and Eiji Aonuma are jealous of Reggie's appearances on the after-dark talk show. 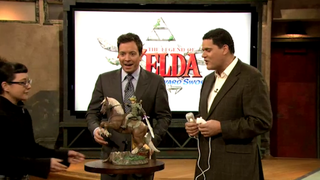 Viewers will also see Fallon get called a ‘natural swordsman' and get gifted a one-of-a-kind Link statue, too. Reggie does some pre-emptive bragging on Skyward Sword's review scores, too, before coaching Fallon through some Zelda combat. And let's just say Jimmy needs the coaching. Excitable, that guy is.